Now realize that the reason the building is condemned is because 2 floors were destroyed when the landing gear from one of the planes ripped through it (some people have said that it was the engine of a plane, but I can't find verification of that). 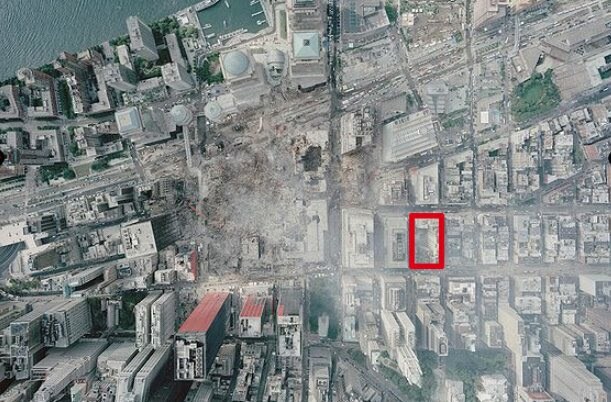 In a very real sense, this building is part of the attacks of the day of 9/11. Who are the people involved with the mosque? Perhaps the most annoying trope after the various attacks we've been subjected to by radical Muslims is the concern that there might be a backlash, that Islam is a religion of peace. Sadly, for many it is not a religion of peace. The Pew Research Center found out that in the United States, 26% of Muslims 18-29 believe that "suicide bombing of civilian targets in defense of Islam" is acceptable at least some of the time (page 53-54 of the full study). So for 26% of young Muslims in the US, Islam is most certainly not a religion of peace. ED BRADLEY, CBS: (Voiceover) And throughout the Muslim world, there is also strong opposition to America's foreign policy, particularly in the Middle East because of its support of Israel and economic sanctions against Iraq. Imam ABDUL RAUF: It is a reaction against the policies of the US government, politically, where we espouse principles of democracy and human rights and where we ally ourselves with oppressive regimes in many of these countries. BRADLEY: Are--are--are you in any way suggesting that we in the United States deserved what happened? Imam ABDUL RAUF: I wouldn't say that the United States deserved what happened, but the United States policies were an accessory to the crime that happened. BRADLEY: OK. You say that we're an accessory? Imam ABDUL RAUF: Because we have been an accessory to a lot of--of innocent lives dying in the world. In fact, it--in the most direct sense, Osama bin Laden is made in the USA. See the clip over at Newsbusters. I love the passive-voice in this clip -- "the crime that happened". No Mr. Rauf, the crime was committed, by Muslims in the name of Islam. There are more problems with him -- Rauf is not on our side in this struggle, and his involvement should be a warning flag. Oh and the developer who bought the property for $4.8 million? He was a waiter in 2002. Where did all that money come from? Apparently the people involved don't have a problem taking money from Iran or the Saudis. Add to all of this the points that Andrew already made, specifically that the name refers back to Islamic conquest of Spain, and the opening date was supposed to be the ten-year anniversary of the 9/11 attacks. Clearly, "sensitivity" is not their goal. The people behind the mosque are not our friends. They are part of the Muslim community who are our enemies. 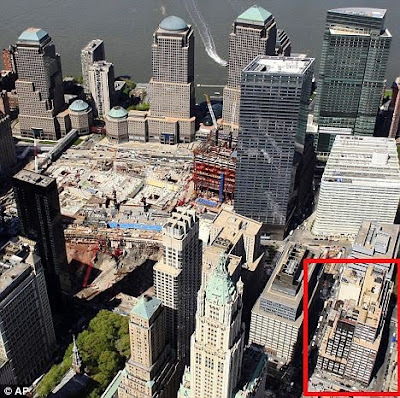 They shouldn't be allowed to desecrate Ground Zero with their victory mosque. "There is no question there is a concerted effort to make this a political issue by some. And I join those who have called for looking into how is this opposition to the mosque being funded," she said. How is it that Nancy Pelosi and the Democratic party want to know how the people who oppose the Mosque are being funded but don't care how the mosque itself is being funded? It seems that if one is liberal enough, one is much more concerned with tearing down conservatives than worrying about a little Wahhabi funding. If you're not familiar with Wahhabism, it's the branch of Islam that produced many of the 9/11 hijackers. They're also the ones that fund schools in the U.S. that produce valedictorians dedicated to assassinating the U.S. President. Usually, the money comes from Saudi Arabia, our dear friends. So it stands to reason we might want to be concerned about them funding a mosque right by the Ground Zero site in Manhattan. 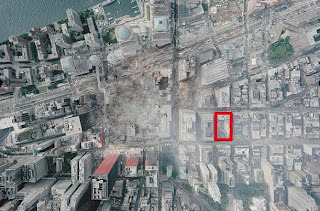 My full take on the issue is that the problem isn't so much proximity to Ground Zero, though that does play a small role. The problem with the proposed Cordoba House (mosque and community center) is intent. The name "Cordoba" points to the Cordoba Caliphate and massive Cordoba Mosque which dominated Spain for a portion of the middle ages. The name symbolizes subjugation of the West. With regard to location, the Islamist tradition of tearing down your church and building a mosque in its place does raise concern. The twin towers weren't a church, but the extremists responsible for the atrocity did see them as core to America's identity. Then there's the fact they want to dedicate and open it on 9/11, commemorating the victory of extremists over unsuspecting Westerners. Why not do it on 9/12, to affirm the solidarity most of us felt following the attack? They've chosen everything about this mosque to be provocative so extremists can see how far they can push the weak, weak West. "Abdul Rauf has cast blame for 9/11 on the US, and even refuses to call Hamas what it is - a foreign terrorist organization," they said. Quite simply the Cordoba House is an undisguised slap in the face to America, or if you prefer, it's extremists showing us the bottom of their shoes. We may have to allow it, but we're perfectly justified in being upset about it.